The FingerTec® TA103C//TA100C offers all of the great functionality of the TA 102 and more. This product is for the FingerTec® USA TA103 (TC Version). The TC stands for Touch Buttons and Color Screen). The TA103 offers the robust software, advanced reporter, but adds a vibrant color screen and touch buttons not found on the TA 102. Furthermore, it offers up to 2,800 templates and 120,000 transactions for larger businesses. If you're looking for dependable and durable biometric time attendance system that includes everything you need to go right from the box, then take a good look at the FingerTec® TA103 from FingerTec®. The FingerTec® 103 is a complete time and attendance solution offering durable hardware as well as the robust TCMS V2 Time and Attendance Software. The FingerTec® 103 is capable of storing up to 2800 fingerprint templates; however, since we recommend 2 templates per employee, the TA103 is ideal for businesses with up to 14000 employees! Even if you don't have that many employees, the TA103 is one of our best selling biometric time attendance systems. It may be priced slightly higher than other systems, but for good reason. 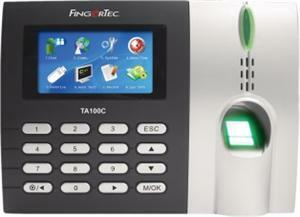 The TA 103 is one of the most feature rich, reliable, durable, and customizable biometric time attendance systems at Fingertec. Read more as we take a closer look at FingerTec® USA TA103 with Color Screen and Touch Buttons. The Fingerprint TA103 is truly an innovative biometric time attendance system that will save your business time and money! With the TA103, you can easily enroll employees to allow them to punch in and out with the simple scan of their fingerprint. Eliminate buddy punching and buddy punching which can cost your business thousands per year in wasted payroll. At under $500 for this complete biometric time attendance package, The TA103 literally will pay for itself in nearly no time at all! The TA103 from FingerTec® USA connects to your PC via TCPI/IP (ethernet), RS232 cable, or RS485 cabling. Even better, the TA103 comes with a USB port to easily transfer data from your time clock to your PC. The TA103 can easily be configured to work by itself or can be configured along with other TA103 clocks if you have a larger building and want to have a clock at different parts of the building that share data to one PC. The FingerTec® TA103 Fingerprint Series Time & Attendance System simplifies your time clock system while giving you the efficiency you need to manage your payroll and human resources.